One of the defining traits of genius is universality, and 342 years after its premiere Molière's Tartuffe remains fresh with insights on fundamentalism and religious hypocrisy, even if Freyda Thomas' translation and adaptation, used in Germinal Stage Denver's current production, is a bit forced. Thomas sets the play in the present, with Orgon as a wealthy businessman who has just purchased a cable TV station. 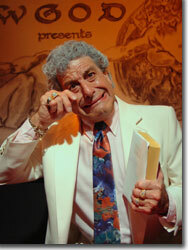 While watching the tube one day, he is dazzled by the televangelist, Tartuffe. 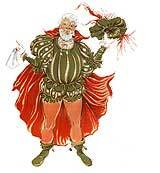 Orgon decides then and there to bring Tartuffe into his family and shower riches upon this so-called man of the cloth. Director Ed Baierlein's cast of ten varies in effectiveness handling the subtler aspects of Moliere's satire and the rendering of the verse, with performances ranging from naturalistic to caricature and the poetry occasionally occluded by the emphasis on rhyme rather than meaning. Michael Shalhoub, always at home as "the devil's advocate," finds the right notes in balancing Tartuffe's public piety and private perniciousness, though his Southern dialect seems to wander along with his character's roving eye. Terry Burnsed's Cléante is both the voice of reason and the stylistic ballast of the production that establishes its realistic premise. Jennifer Anne Forsyth, as the punk-influenced Dorine, Suzanna Wellens, as the comely and clever Elmire, and Kristina Denise Pitt, as Orgon's delicious daughter, also manage to make contemporary sense out of Thomas' somewhat florid rendition. Stephen R. Kramer bookends the production with compelling turns as the classical Prolog and the film noir send-up Agent Loyal. Using dogma to swindle God-fearing folk out of their hard-earned shekels is as old a ploy as organized religion, and certainly the holier-than-thou posturing that dominates our national landscape provides a number of telling and humorous parallels between Molière's time and our own. But the obviousness of this comparison not only makes Thomas' metaphor feel belabored, it stretches credulity, as when we're told that George W. Bush has intervened to save Orgon's family from Tartuffe's hypocritical flimflam. When a cowboy from Crawford, Texas becomes the deus ex machina (standing in for the Sun King, no less), we've lost our way. The Germinal Stage Denver's production of Tartuffe: Born Again runs through October 8th. 303-455-7108.